A wildly popular file-sharing website with ties to Hip Hop super-producer Swizz Beatz was shuttered Thursday in a federal sting targeting illegal downloads. Federal prosecutors pulled the plug on Hong Kong-based Megaupload.com, arrested four execs in New Zealand and unsealed an indictment charging seven people with content piracy causing losses of a half a billion dollars. The indictment prompted hackers to seek immediate cyber revenge, with the shadowy Anonymous group claiming it crippled the Department of Justice website. The government site was inaccessible for hours Thursday, but a DOJ spokeswoman declined to comment on the cause. The Motion Picture Association of America said it was hacked in retaliation, but the site was back up Thursday night. Beatz, whose real name is Kasseem Dean, was not named in the government's five-count indictment. The beatmaster, who married singer Alicia Keyes in 2010, was in recent discussions to take a high-powered job at Megaupload, but a final agreement was not reached, the company's lawyer told the Daily News. "He was in conversations to be named CEO," lawyer Ira P. Rothken said. "His involvement in the company was highly attenuated. There were discussions and he was involved in a promotional video and in brainstorming future projects, but not much else." Swizz Beatz's association with the cloud sharing site surfaced only recently after he and buddies Sean "Diddy" Combs, Kanye West and Will.i.am touted the site in a video that prompted legal backlash from the artists' label, Universal Music Group. 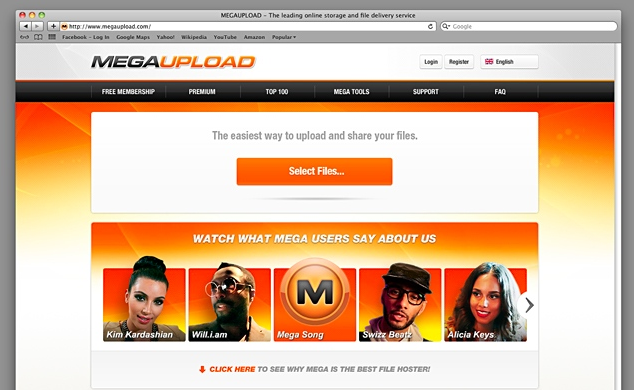 The four-minute clip, part of Megaupload's recent Dec. 9 relaunch, was all original material and not subject to ownership by UMG, Rothken said. The government's 72-page indictment, which alleges copyright infringement as well as conspiracy to commit money laundering and racketeering, claims Megaupload rewarded users who uploaded pirated content and turned a blind eye to copyright-holder complaints. The feds said ill-gotten executive gains subject to seizure likely would include a Rolls-Royce Phantom, several Mercedes-Benz vehicles, a jet ski and a Von Dutch Kustom motorcycle. Before Megaupload was taken down, it posted a statement calling the allegations "grotesquely overblown." "We believe the allegations in the indictment are without merit, and the company will vigorously defend itself," Rothken told The News.